Guidance Through the Inner Man Many have difficulty finding the will of God. But as Kenneth E. Hagin shows in HOW YOU CAN KNOW THE WILL OF GOD, guidance through the inner man is something that can be learned and developed. Rev. Hagin begins by explaining who the inner man is, and then points out the difference between the inner witness and the inner voice. He also shows how Christian scan receive guidance through visions. He concludes by illustrating how prophecy can be used for guidance. Finding God's will is not difficult when the believer learns to follow his inner man. Rev. Hagin believes that our spirits have been kept locked away in a prison, so to speak, and that most Christians have let thoughts or feelings guide them. By learning to hear the voice of the Spirit of God, we can depend on our own spirits to help us flow with God in every facet of life. How You Can Know The Will Of God by Hagin Kenneth E was published by Faith Library Publications in January 1972 and is our 22257th best seller. 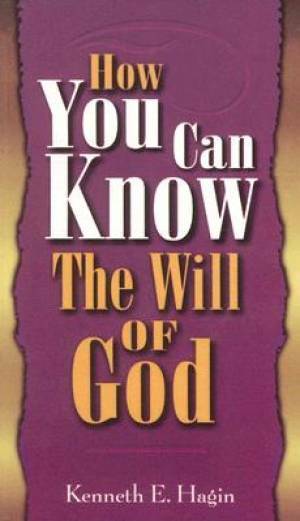 The ISBN for How You Can Know The Will Of God is 9780892760190. Be the first to review How You Can Know The Will Of God! Got a question? No problem! Just click here to ask us about How You Can Know The Will Of God.